The day after I cooked this dish, I got some feedback from my BIL via my MIL. “Yesterday’s dinner was the best”. That night I cooked a simple stir fried cos lettuce with garlic, this braised tofu with mushrooms and clams in broth (a modified version). He didn’t touch the clams as he is trying to avoid foods that may trigger pimples. So, all he ate was this tofu and the lettuce. This cookcook that I took the recipe from is older than me. Given to my mom by my Aunt Grace. My mom has now passed it to me so that it will be well utilized. It doesn't look at fancy as the one below as the one I have was printed in the 1970's, and employs lots of MSG in the recipes, hehehehehe. Last time, I would only be interested to try out recipe that visually look appealing to me, because when one hasn’t tried cooking many recipes, we seem to not notice the ingredients involved and the combinations of flavour, besides of what is usually served in restaurants. 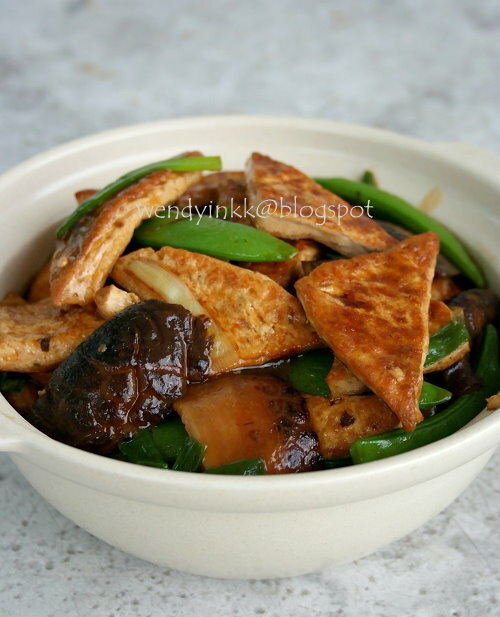 A simple tofu with mushrooms, how special could this be? Right? It sure does look simple, with not a piece of meat involved…but the flavour is good (make sure your wok is very hot at step#2). My MIL commented it smelled very good. My husband who prefers soft smooth tofu didn’t eat too much. It was mostly walloped by my MIL and BIL. One man’s poison is another man’s meat. So, I won’t know if this appeals to you. As stir frys are also dependant on the wok and the heat applied. The original recipe called for only 3 pcs of tofu for that big plate. I do notice all the tofu recipes in the book uses just 2-3 pcs. So I think the tofu they meant in the book is those huge palm sized blocks that I used to see when I was a kid, where my mom only used 2 blocks to feed a family of 8. I made adjustments accordingly to the type of tofu I could get nowadays. 1. Half tofu to become triangles. Slice each triangle to become 3 thin pieces. Fry the tofu triangles until golden. Dish up. 2. 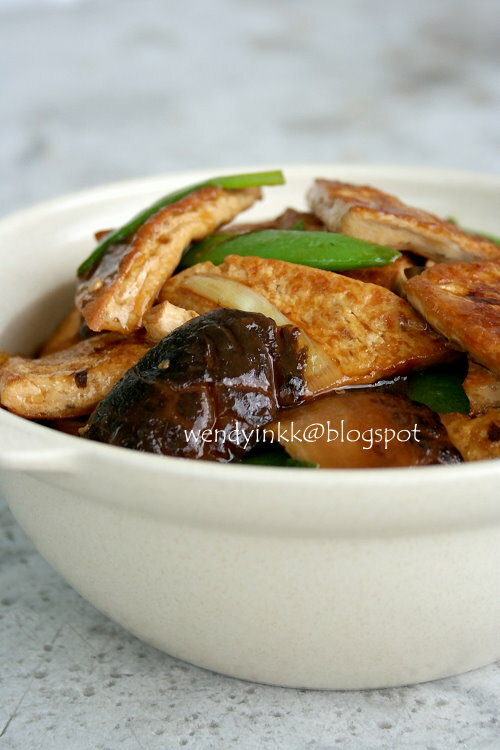 Heat wok until very hot and put in 1 Tbsp oil. Fry spring onion until fragrant. Put in both mushrooms and tofu and the braising liquid. Give it a light toss just to mix it around. Bring it to a boil. Cover with lid and let it braise on medium low heat until the braising liquid is reduced to half. 3. Taste the gravy and adjust if needed. Put in the peas and let it cook for 10-15 seconds. Tofu is my favourite dish so no doubt this seem delicious to me. You are right a few "flower" slices of carrot make this dish more beautiful and presentable. Tofu, good alternative to meat.....nice too! Wendy, I know I will love this dish. It's good to go meat free once in a while. i agree to put some carrot to make it look perfect. hi... also can add some baby corn. THat looks yummy, my mom would love this too! my mum does this quite often too (: love the mushrooms especially after they absorb all that yummy braising sauce. so juicy! No onion nor ginger.. better try this later.. tempting!! 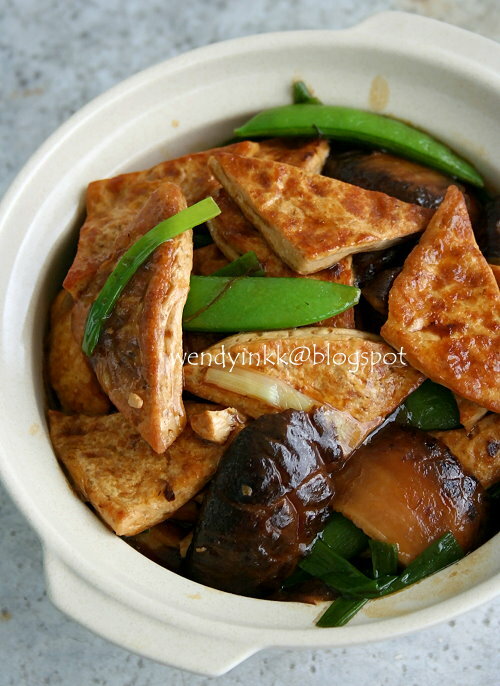 I have to try this dish too as I love tofu. I happen to have the same book too.